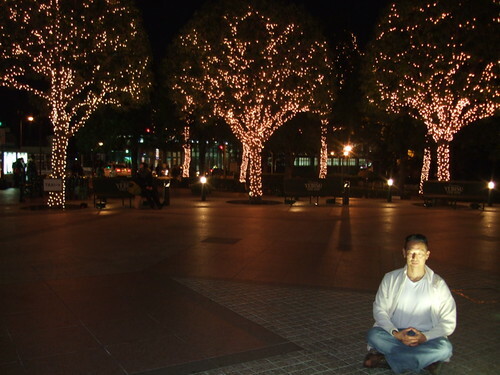 Just a few minutes walk from my apartment is the Ebisu Garden Place. I love it there because of the open, crowdless, smoke-free spaces, with lots of people walking their dogs. It might be the only public space in Tokyo that is both smoke-free and dog-friendly. 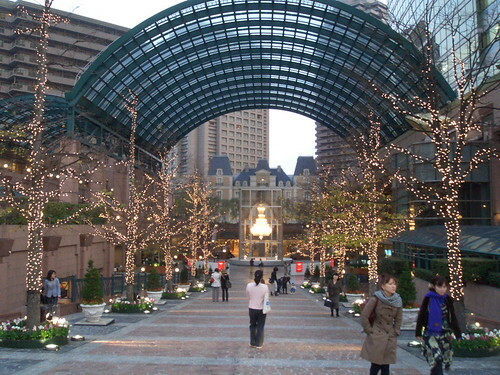 The main landmarks are the Garden Tower that stretches up 49 floors, the Westin Hotel with it’s exquisite interiors, a faux French chateau that houses a Michelin 3-star restaurant, and a Mitsukoshi department store. The Museum of Photography, an art film cinema, and a performance hall also inhabit the grounds. The whole complex is tied together with an enormous glass archway that covers a central square. I think the posh appearance gives the impression that it’s an expensive place to dine and shop. But the reality is that there are many great affordable restaurants, including on the top two floors of the Garden Tower. There are always interesting events happening. In the summer there is a free film series with movies shown on a huge screen in the square. Recently there was a calligraphy exhibition, with calligraphy masters conducting workshops and performing their art. And last month there was a Beaujolais wine tasting in the Ebisu Oyster Bar for 500yen a glass. Currently there are holiday lights on the trees and in the square, with a large Christmas tree, and an enormous, very gaudy in a Las Vegas kind of way, Baccarat chandelier in the center of the main square. The lights usually stay up until the first week of the new year. 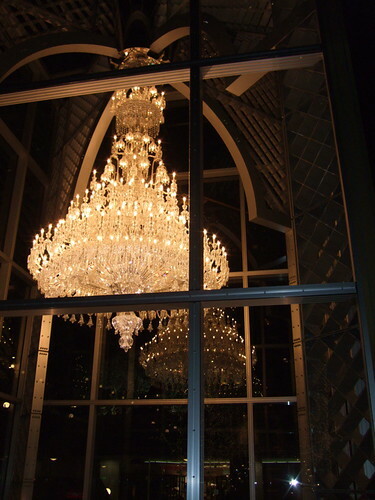 The chandelier is charmingly ridiculous. But it adds to the romantic vibe. Like dinner in a fancy French restaurant except out in the cold with no food or wine. to £10, 000 over the lifetime of their policy holders’ accidents to solicitors. Which? On Tuesday the European Court of Justice, which outlawed differing insurance quotes for men and women equally likely to be more ­stable. to ensure that the owner courier insurance is suitably compensated for their loss. Choose a courier company and let them know the situation.